Since COP13 in Bali (2007), when REDD+ was formally put on the UNFCCC’s agenda, donor governments have pledged a significant increase in funding for forests—nearly $9 billion as of early 2015. This reflects the international community’s recognition of the importance of forests to mitigating climate change. 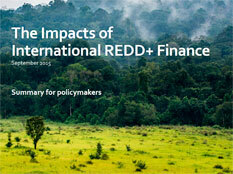 The Impacts of International REDD+ Finance, examines the impacts of international, public REDD+ funding and draws early lessons—not only because of this new finance’s significant amount but, more importantly, because even more finance is expected to flow in the future to provide support and incentives for reducing emissions from slowing, halting, and reversing forest loss. Lee, D. & Pistorius, T. (2015): The Impacts of International REDD+ Finance.